The mission of the Each One Teach One orientation is to provide new students of color with an informative introduction to Cornell College that meets their specific needs not covered in New Student Orientation. 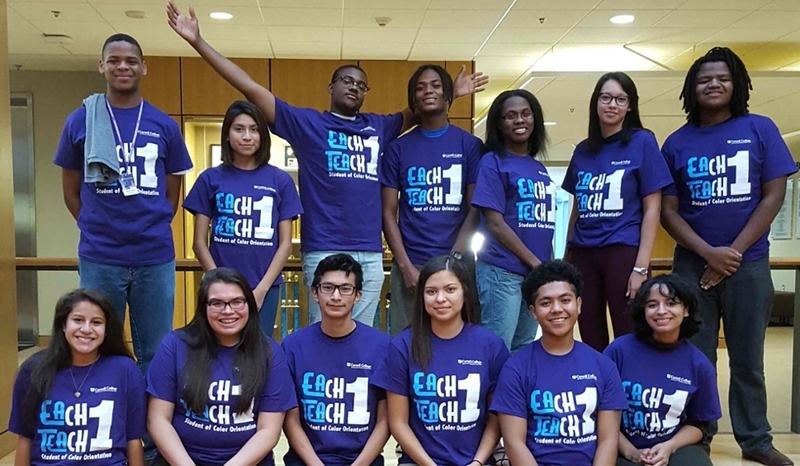 The goal of Each One Teach One is to acquaint new students of color with the resources available to them at Cornell College and connect them to other students and organizations on campus. The Office of Intercultural Life believes an opportunity for new students of color to meet other students of color and current student leaders of color is important in creating and fostering community. The purpose of Each One Teach One is to ease student transition from home to the rigors of living and adjusting to a demanding residential community. The Office of Intercultural Life will provide successful strategies to navigate highly demanding course curriculum and extracurricular activities during the Each One Teach One orientation. The desired outcome for the orientation is to assist in the academic and social development of new students of color, by exposing them to the Cornell College community and the many programs and opportunities available for them. The foundation of this program is built on mentorship, role modeling, and authentic dialogue. It is in this vein the program took its name after the African proverb Each One Teach One… Each One Reach One. Any first year student who is classified as a student of color by the college. Identities included, but not limited to African American, Latinx, and American Indian.